Changing the status of orders can help you keep them organized. For example, if you just printed a pick list, you can move the selected orders to Waiting for Seller status to keep them separate from newly imported paid orders. When you add tracking numbers to all of the items in an order, the order's status will update to Shipped. We'll also automatically send the tracking and shipment info to eBay so that its status will be updated to Shipped on eBay too. 1) Hover over the SolidSync icon in the APPS sidebar menu and click on Order Manager. 2) Select one or more orders. 3) Select a status from the CHANGE STATUS drop-down menu in the action bar. If you want to change the status to Shipped, please see the next section Adding Tracking Numbers and Shipment Information to an Order. 4) Click SAVE or CONTINUE in the confirmation overlay to finalize the status update. NOTE: If you select more than one order, you will be able to change the orders to Shipped status in bulk. However, you won't be able to enter tracking info. 2) Select Shipped from the CHANGE STATUS drop-down. If you clicked on the SC ORDER ID to access the order details, click on the ADD TRACKING button in the action bar. 3) In the overlay window, enter your tracking number in the Tracking # field. If you haven't shipped all of the items in the order yet, uncheck any unshipped items. The order will move to Partially Shipped status after you SAVE your tracking. 4) Select a Shipping method from the Ship with combo box. 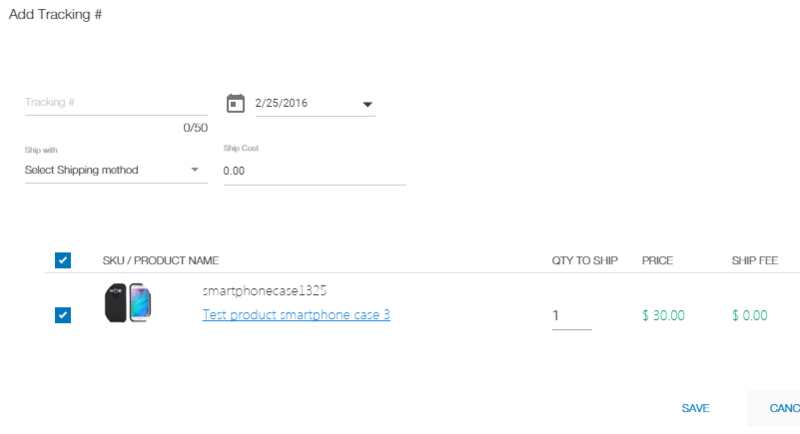 5) Optional: If you want to record the cost you paid to ship the package, enter the Ship Cost. 1) Click on the Order Status drop-down. 2) Select the status you just changed your order to. Select All to view orders with any status. You can also add other filters, such as SKU / Item Location ID or Buyer / Recipient Contact Info, to narrow your results further. 3) Your order should be visible again. 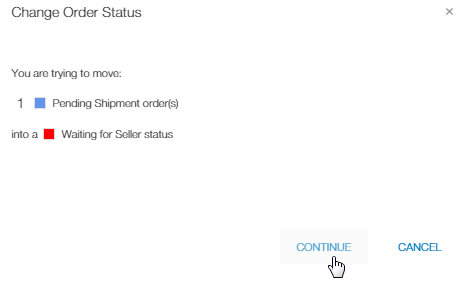 If you want, you can change its status back to Pending Shipment or move it to another status.